Lt. Gov. John Fetterman chucked his normal wardrobe for a newly purchased charcoal suit (from a big and tall men’s store near Braddock), a new white dress shirt with 48-inch sleeves, and an extra-long black tie, to take his oath of office in the Senate chamber. 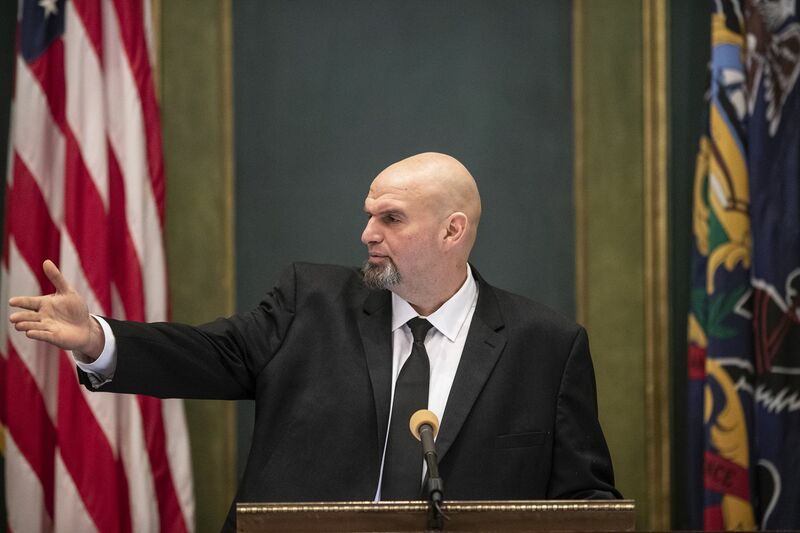 But John Fetterman, inaugurated Tuesday as lieutenant governor, offers a possibility of change in public service that needs to be acknowledged. Because the most striking thing about Fetterman isn’t what gets most notice. It’s not his size, his tattoos, his signature dark work clothes, or his visage, which can range from gentle giant to imposing biker-bar bouncer. And the fact that those choices led to elected statewide office. In decades of covering politics, I’ve not encountered a story such as his. This 49-year-old York County native, since grad school — he holds graduate degrees from the University of Connecticut and Harvard — has done public service at hands-on levels. Big Brothers Big Sisters in Connecticut, AmeriCorps in Pittsburgh, a GED program in Braddock, then 13 years as Braddock mayor fighting to salvage the wreck of a small former steel town near Pittsburgh at a salary of $150 a month. Not to sugarcoat here, but Fetterman’s career path is righteous, and rarely a fast track to higher office. He calls himself “a social worker” who accidentally ended up as lieutenant governor. His unconventional style, different voice, and pattern of public service caught my attention during his improbable (and failed) 2016 U.S. Senate primary run. I wrote then that statewide voters at some point might listen to different voices. On Tuesday, Fetterman chucked his normal wardrobe for a newly purchased charcoal suit (from a big and tall men’s store near Braddock), a new white dress shirt with 48-inch sleeves, and an extra-long black tie, to take his oath of office in the Senate chamber. And, yes, his office, which pays $166K per year, gets ridiculed as worthless and unnecessary, its duties limited to chairing the state Board of Pardons, presiding in the Senate (with a vote in case of ties), and if necessary serving as governor. But stay tuned. Don’t expect a disappearing act. Expect Fetterman to use his pardons gig to push criminal justice reforms. And Gov. Tom Wolf has asked him to look at legalizing marijuana. In a pre-inaugural sit-down with Fetterman and his Brazilian-born wife, Gisele — a former undocumented immigrant in New York from ages 7 to 19 — the couple, parents of three young children, talked about what’s ahead. Gisele, like her husband of 11 years, is all about service. They met after she read of Fetterman’s work as Braddock mayor and wrote him asking how to help. She ended up in Braddock, then became the mayor’s wife. She since founded the Braddock Free Store and a food rescue service (both of which have expanded) and For Good Pittsburgh, which includes an incubator for female-owned businesses. She’s clearly got a sense of humor. She’s adopted the acronym SLOP, Second Lady of Pennsylvania. “I’m gonna own it,” she says. She, too, is interested in criminal justice reforms, especially making children’s visits to inmate parents easier. “Depending on how cynical a view someone wants to take, I spent four terms working in a completely marginalized and largely forgotten community because I genuinely believe in the sanctity of public service. Meanwhile, Fetterman is eschewing the lieutenant governor’s residence. Says the state doesn’t owe him housing. He’s renting a house within walking distance of the Capitol. Why do I think he could bring change to public service in a state where so much public service has earned a bad name? His example. His life choices. And the possibility he influences others.